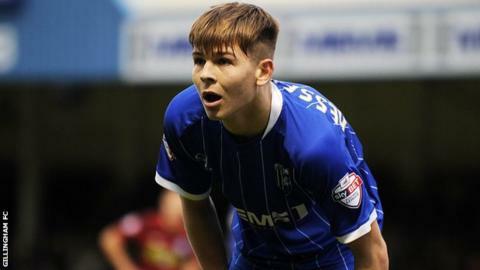 Gillingham went top of League One after a narrow win over Doncaster Rovers. Jake Hessenthaler's second-half strike settled the match after the assistant referee ruled his effort from close range had crossed the line. Thorsten Stuckmann's diving save from Luke Norris denied the Gills a second goal with 10 minutes remaining. Curtis Main and Oscar Gobern went close for Rovers in the first half, while Richard Chaplow and Cameron Stewart missed chances after the break. The Gills remain unbeaten in the league and moved to the top of the table after Walsall were beaten at home by Bury. Match ends, Gillingham 1, Doncaster Rovers 0. Second Half ends, Gillingham 1, Doncaster Rovers 0. Rory Donnelly (Gillingham) wins a free kick on the left wing. Substitution, Gillingham. Rory Donnelly replaces Luke Norris because of an injury. Corner, Gillingham. Conceded by Thorsten Stuckmann. Attempt saved. Ben Williamson (Gillingham) left footed shot from the right side of the six yard box is saved in the bottom right corner. Attempt missed. Luke Norris (Gillingham) right footed shot from very close range is too high from a direct free kick. Foul by Oscar Gobern (Doncaster Rovers). Attempt missed. Luke Norris (Gillingham) header from the centre of the box is close, but misses to the right. Attempt missed. Cameron Stewart (Doncaster Rovers) right footed shot from the left side of the box is just a bit too high. Attempt saved. Luke Norris (Gillingham) right footed shot from outside the box is saved in the centre of the goal. Corner, Gillingham. Conceded by Oscar Gobern. Hand ball by Dany N'Guessan (Doncaster Rovers). Oscar Gobern (Doncaster Rovers) wins a free kick on the left wing. Attempt blocked. Oscar Gobern (Doncaster Rovers) right footed shot from outside the box is blocked. Substitution, Gillingham. Ben Williamson replaces Cody McDonald. Attempt saved. Cameron Stewart (Doncaster Rovers) right footed shot from the centre of the box is saved in the centre of the goal. Substitution, Doncaster Rovers. Dany N'Guessan replaces Curtis Main. Substitution, Doncaster Rovers. Cameron Stewart replaces Cedric Evina. Goal! Gillingham 1, Doncaster Rovers 0. Jake Hessenthaler (Gillingham) right footed shot from the centre of the box to the bottom right corner. Assisted by Ryan Jackson. Attempt missed. Oscar Gobern (Doncaster Rovers) left footed shot from outside the box is close, but misses to the left. Attempt saved. Emmanuel Osadabe (Gillingham) right footed shot from outside the box is saved in the top centre of the goal. Attempt missed. Ryan Jackson (Gillingham) left footed shot from the right side of the box is too high. Substitution, Gillingham. Jake Hessenthaler replaces Jordan Houghton. Attempt saved. Andy Williams (Doncaster Rovers) left footed shot from outside the box is saved in the centre of the goal. Attempt missed. Richard Chaplow (Doncaster Rovers) right footed shot from the centre of the box is close, but misses to the left.